This is part of an ongoing collection of women’s stories in Whole Woman’s Health clinics that we will be posting all week. These women have all had to struggle and jump through different hoops as a result of the passage of House Bill 2 in July of 2013, and they deserve to have their stories told. “They don’t have abortion clinics up there at all,” said one of our patients at Whole Woman’s Health of Austin last week. She left her shift at a local casino in Lake Charles, LA and drove the 4.5 hours one way to Austin to get an abortion. After discovering she was 13 weeks pregnant, the patient decided that she wasn’t able to have another child, especially since she already has a 7-year-old, a 5-year-old, and a 3-year-old that her mom had to watch while she drove to Austin for her procedure. Not only is she now part of the 1 in 3 women in the United States that will get an abortion, she is also part of the 60% of women that have abortions that also already have children. 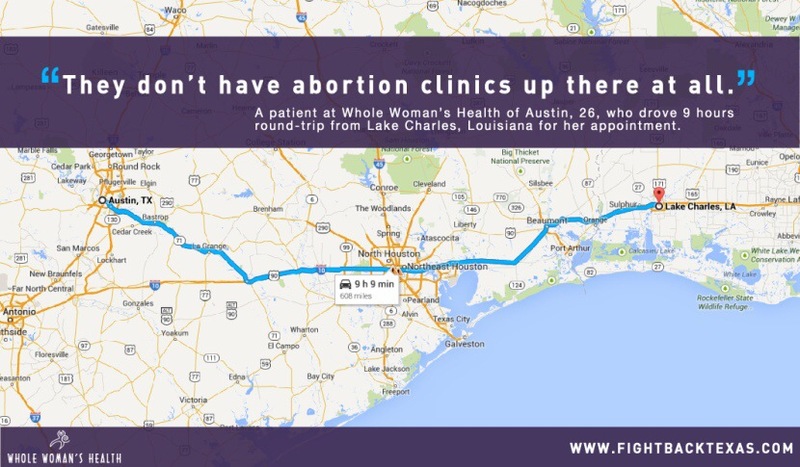 Before March, this patient would have been able to access safe abortion care at Whole Woman’s Health of Beaumont, which is about an hour’s drive from Lake Charles and just west of the border between Louisiana and Texas. Since our Beaumont clinic is not able to meet the standards of an Ambulatory Surgical Center as laid out by House Bill 2, we had to close after serving the women of East Texas and surrounding Louisiana communities for almost 10 years with safe, compassionate abortion care. The patient was able to get an appointment at Whole Woman’s Health of Austin quickly, though it’s unfortunate that she was forced to drive over 600 miles round-trip to obtain healthcare that she so desperately needed. To read more personal stories and/or to speak up and have your voice heard about the harmful effects of House Bill 2, go to http://www.fightbacktx.com.